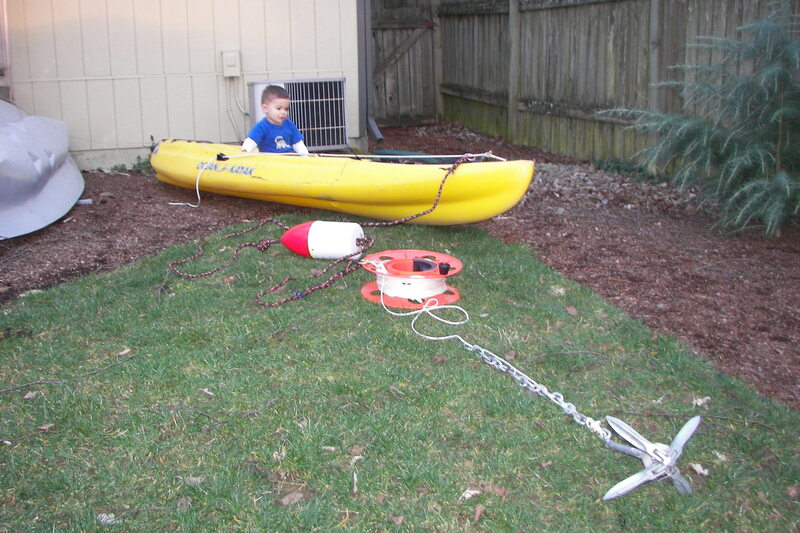 My set up is pretty much like this one by FishShim of NCKA (below) except I'm using the extension cord winder and my choice to add an anchor chain instead of the 2 lb weight. Oh another difference with mine.. I think my bow line configuration is probably safer than FishShim's stern line in the Willamette. We saw a lot of large pieces of wood coming down stream and unlike power boats they really don't make much warning noise. I was glad to face up river so I could seem them coming. A stern line however would have been much nicer to fish with because it would allow your line to stay in front of you and you wouldn't have to worry about the anchor line in front of you. I'm choosing safety over convenience. As for the 300 ft of line. I probably could have ordered a whole spool somewhere online, but I bought 3 x 100 ft bags of line (3/16" braided nylon) at Joe's for about $7 each. I tied them together to make one long line. I'm not too worried about the knots. If anything, I figure they provide a weak link in case I find myself unable to retrieve the anchor from the bottom. Better to break off deep, then to cut the line near the surface and create a possible hazard to navigation. Anyway, the knots also work as 100 ft line markers. I used a sharpie to mark out 50 ft sections in the second and third hundred feet and 10 ft sections in the first 100 ft to use as a rough sounding line. When I get on station, I detach the reel from the buoy, drop the anchor and let the line spin off the reel pretty quickly. When I hit bottom I figure out the depth (a fish finder eliminates this stop, but they don't always function right), then I feed out enough line for a 3:1 or 4:1 scope depending on current. 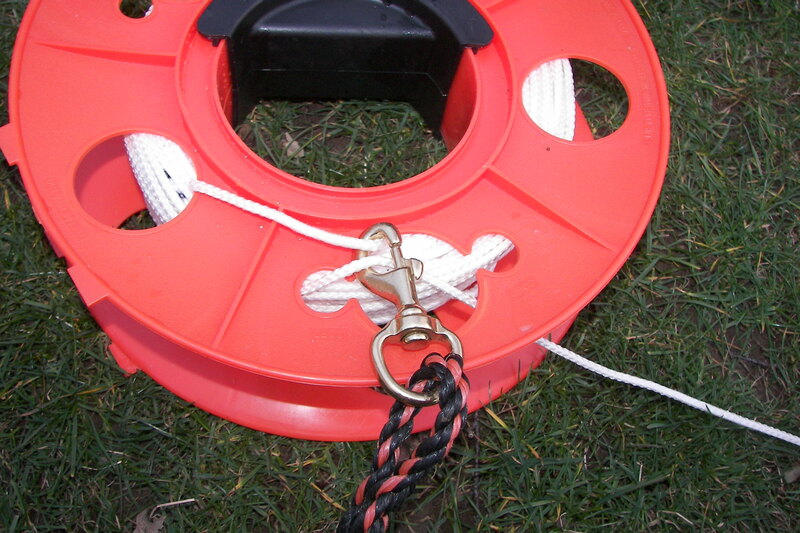 I then reattach the reel to the buoy line such that the line can no longer spin (photo later) and toss the reel and buoy into the water attached to the quick release bow line. Being made of plastic it doesn't weigh the buoy down but does cause some minor drag. Anyway, to pull up the anchor, I paddle upstream first until the anchor tightens again, detach the reel from the buoy line and start reeling as I float back down. Once I get above the anchor with the line straight down I give it a tug and reel the anchor up. Works pretty well, and I can deploy and pull anchor pretty quickly. I must add though that the current really wasn't that bad on Sunday, so I'm not sure how good of a test this really was. 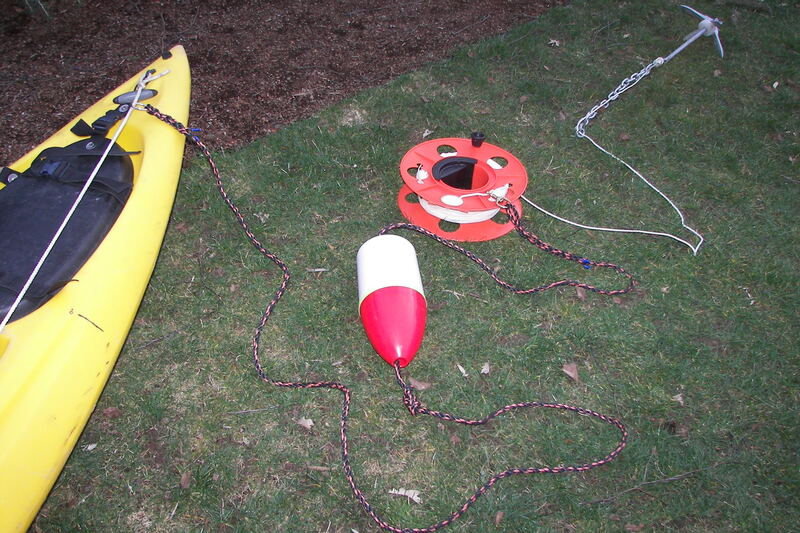 I could always get slightly thinner line, a bigger buoy, and a heavier anchor if need be.